El Matador State Beach in Malibu, California. 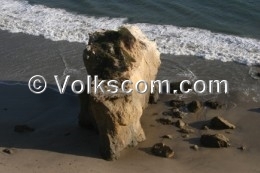 The El Matador State Beach is located west of the city of Malibu. The parking lot of the El Matador State Beach is situated close to the California State Route 1 (Pacific Coast Highway / Highway 1). The parking lot is not paved (it is made of gravel). A wooden stairway leads to the leveled sandy beach. A lot of small and large rocks are lying in the sand of the beach. The view is beautiful. Visible are the mansions of Malibu and the beach. From Pacific Coast Highway, also known as California State Route 1, turn on El Matador Beach Road towards the parking lot of the El Matador State Beach (parking fee is charged ). - Not ranked at the Beach Ranking.